1880s autograph album that belonged to schoolgirl Mamie Dorr of West Pittston, Pennsylvania. 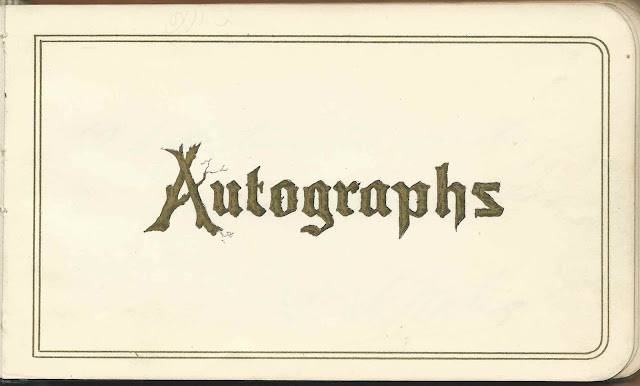 The album contains inscriptions from Pittston, West Pittston and other towns in Pennsylvania; Columbus, New York; and Ironton, Ohio. 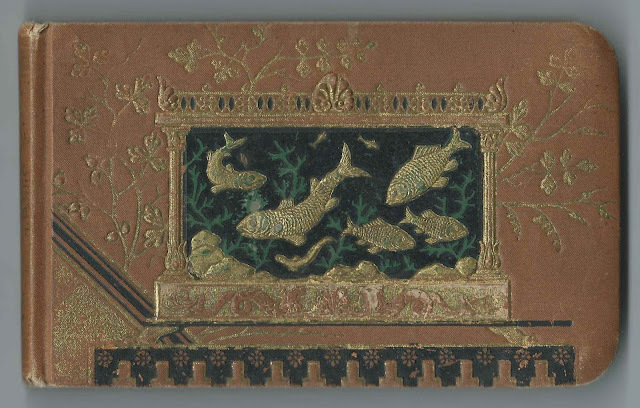 The album measures approximately 6-1/4" by 3-3/4" and contains the sentiments of about 54 of Mamie's relatives, friends and schoolmates. An alphabetical list of the inscribers, together with any personal information they offered, appears at the end of this post. Mamie may have been the Mary H. Dorr who was born about 1871 in Pennsylvania, the daughter of Charles E. Dorr and Louisa (Smith) Dorr of West Pittston, Pennsylvania. This Mary died in 1954 and is buried in the West Pittston Cemetery at West Pittston, Pennsylvania, with her parents and other relatives. Aunt Julia. Presumably Julia (Smith) Miles, wife of inscriber David T. Miles. Presumably Julia was related to Mamie's mother Louisa (Smith) Dorr, perhaps a sister. Mattie Miles of Ironton, Ohio. Interestingly, there was a Nathaniel Miles, who was the son of inscribers David T. Miles and Julia (Allen) Allen. The Ms in Mattie and Miles appear identical, but it's possible the name is Nattie Miles. Waity [?] H. Purdie of Columbus, New York; inscribed on October 11, 1882. Called herself Mamie's cousin. "Waity H. Purdie aged 78 years & 3 months". She was Waity (Howard) Purdie, born July 28, 1804, and husband of Samuel Purdie, who also inscribed a page. Elvira C. Purdie of Columbus, New York. Elvira C. (Allen) Purdie, whose husband William Purdie inscribed the right facing page. Elvira appeared to have suffered from tremors or perhaps a vision problem, or both. William H. Purdie of Columbus, New York; inscribed on October 13, 1882. His wife, Elvira C. (Allen) Purdie, inscribed the left facing page. Samuel Purdie; inscribed at Columbus, New York, on October 13, 1882. "Aged 78-12 days-6 months- Last". Samuel was born June 12, 1804. His wife, Waity (Howard) Purdie, also inscribed a page in the album. Lucinda A. Purdie of Columbus, New York. Lucinda Angell Purdie was the daughter of inscribers Samuel Purdie and Waity (Howard) Purdie. If you have corrections and/or additions to the information above, an alternative theory for the identify of Mamie Dorr or information on any of the inscribers listed below, please leave a comment or contact me directly. Matie; inscribed on September 3, 1882. "Tomorrow is the much dreaded yet hoped for day. the first of school". Unsigned sketch of a house with the door marked, "Two Kinds of door's 1. door & 2. Dore [presumably meant to be Dorr]"
Jennie; inscribed at Pittston, Pennsylvania, on February 26, 1883. Jennie called herself album owner Mamie's seatmate. Mamie Dorr of West Pittston, Pennsylvania; album owner. Her name, and that of Lizzie McMillan, appear on the last end paper. Mamie was then 13. Lizzie McMillan; inscribed at West Pittston, Pennsylvania; inscribed on January 25, 1883. The words "seat mates" straddle this and the right facing page inscribed by Jennie O. Thomas. 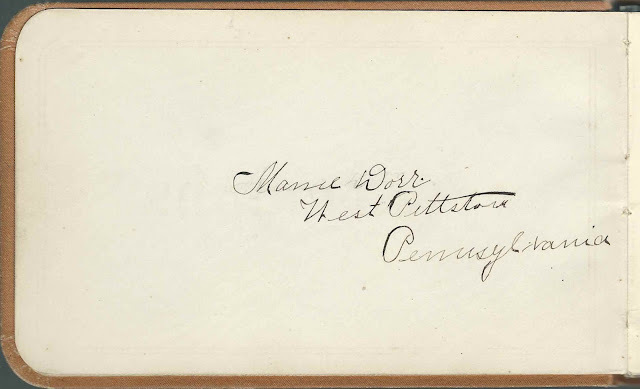 Lizzie's name and that of album owner Mamie Dorr appear on the back end paper.